People magazine tells the story of a woman who pushes her quadriplegic boyfriend along the Boston Marathon route—because love is bigger than any injury. Just days before he would turn 29, Matt Wetherbee was anxiously anticipating one of the biggest moments of his life—proposing to his longtime girlfriend, Kaitlyn Kiely, after she returned from an upcoming weekend trip. Instead, Matt would spend his birthday in a hospital undergoing spinal fusion surgery. On June 7, 2016, the Massachusetts native was playing his weekly basketball game in his local men’s league, when a routine drive to the basket turned into a life-altering play. Matt suffered tears to ligaments and damage to the upper portion of his spine, leaving him completely paralyzed from the shoulders down. While he is still paralyzed, what followed has been nearly two years of intensive therapy and electronic stimulation in the hopes that one day he will be able to rise from his wheelchair on his own. All the while, Kaitlyn has been by his side as they adjust to their new life together. 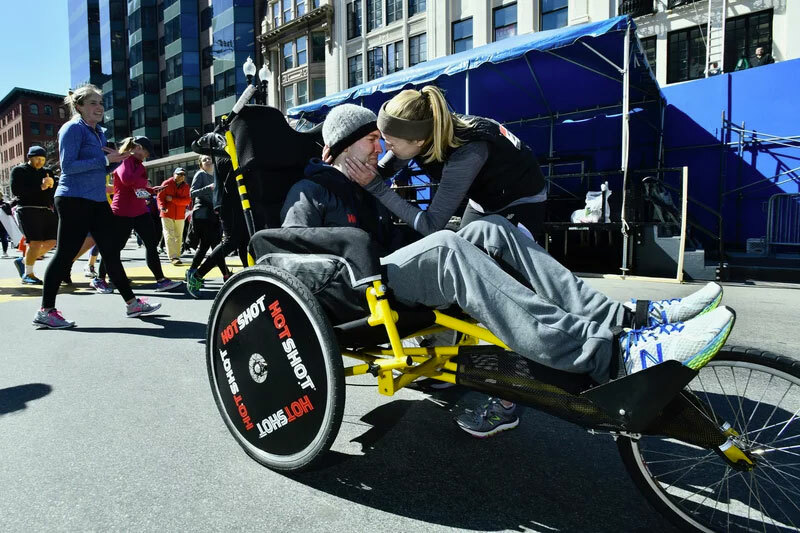 To show people with disabilities they can still be “crazy and brave,” the couple set out to participate in the Boston Marathon on April 16, where Kaitlyn planned to push Matt along the 26.2-mile route in his wheelchair. Yet, the couple missed an “Athletes With Disabilities” application deadline and were unable to participate in the official race. Not all was lost, though, as the couple joined with HOTSHOT, a local company, to complete the Boston Marathon course the Monday before the world-famous event. Kaitlyn borrowed a racing chair and piled it with 50-pound bags of salt to train for the run. Week after week, she’d increase her mileage and the amount of bags she placed on the chair to get as close as possible to what pushing Matt in his wheelchair might feel like. Then, on the morning of April 9, the couple set out on the hilly Boston Marathon course, with friends and family lining the streets to cheer them on along the way. Crossing the finish line five and a half hours later was a special moment for both of them, Matt says. For Kaitlyn, the run wasn’t just about making it to the finish, but about who she was with while doing it. She wasn’t just pushing her boyfriend—they were pushing each other. HOTSHOT then presented the couple with a $25,000 check that will go to Matt’s physical therapy center, Journey Forward, which specializes in helping those with spinal cord injuries. The couple also hopes to raise money for Matt’s therapy sessions, which can cost $100 an hour without the help of insurance, and have set up a fundraising page for those who would like to help. Since his injury, Matt hasn’t yet asked Kaitlyn to marry him as he planned two years ago. He is still waiting for that perfect moment, he says, and he has an idea in mind. “I want to be able to do it myself, with my own arms. Depending on how long that takes, we’ll see,” Matt says.